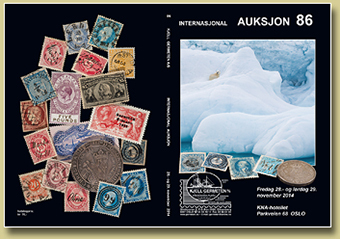 International stamp auctions in Oslo. The Internet version of the auction catalogue. Auksjon #86, November 28./29. 2014. The entire catalogue (75 MB). Coins & banknotes (10 MB). International auction # 84 in Oslo on December 6. and 7. 2013. Pages 1 thru 218. 47 MB. Postcards, pages 7-38, 20 MB. Visit our gallery, featuring a majority of the lots in enlarged images! International auction # 83 in Oslo on November 30. and December 1. 2012. The complete catalogue (Pages 1-200) 57 MB. Postcards (pages 7-51) 16 MB. Coins & Banknotes (pages 52-74) 6 MB. Philately (Pages 75-200) 36 MB. Please visit our gallery featuring enlarged images of the items in the catalogue + some extras! You are welcome to submit your bids by sending an email. Don't forget to include your complete Postal address! Catalogues from previous auctions. You will find several at the bottom of this page. The easy way of finding lots in the catalogue. The Internet version of a catalogue is rather big. information given in the column at the right hand side. Using bookmarks to navigate directly to your collecting favorites! You will find the bookmark symbol on the upper left hand corner of you pdf-reader. We have bookmarked the major sections in the catalogues. By using the search function you can navigate to any part of the catalogue containing the phrase you have typed in the upper right hand corner in your pdf-reader. in Oslo on Friday December 2.
and Saturday December 3. 2011. Postcards. Pages 7-45. (13 MB). Enlarged images of the items. Coins and baknotes. Pages 46-68. Philately. The catalogue with postcards and coins not included. Pages 69-216. (68 MB). in Oslo on Friday April 15.
and Saturday April 16. 2011. Postcards. Page 7-34. (10 MB). Coins and banknotes. Page 35-47. (3,5 MB). International Stamp Auction # 79, Saturday December 4. 2010: The complete auction catalogue. 200 pages. (65 MB). Postcards. Page 7-30. (10 MB). Coins and banknotes. Page 31-40. (3 MB). on April 23.- and 24. 2010. The complete catalogue. Pages 1 through 164. (52 MB). Postcards. Pages 7 through 21. (5 MB). Coins / banknotes. Pages 22 through 31. (3MB). on November 20.- and 21. 2009. The complete catalogue. Pages 1 through 184. (42 MB). Postcards. Pages 7 through 35. (12 MB). Coins / banknotes. Pages 36 through 38. (1MB). on April 24.- and 25. 2009. The complete catalogue. Pages 1 through 180. (40 MB). on November 28.- and 29. 2008. The complete catalogue. Pages 1 through 184. (49 MB). The pages 147 through 166. Postcards. (4,3 MB). It's for free. Good luck! We will recommend you to download the files instead of opening them in your Internet browser. Right click on the file and select "save" and "save target as" (do not select "open"). Browse your hard disk to select a suitable place to save it. Afterwards you can study the catalogue nice and easy even after having closed your Internet connection. The pdf-files features a lot of advantages. You can for instance search for special words and names, or using bookmarks to directly access a preferred section, to mention some. Being a specialized collector is proving more easy!